Spring is in the air! Time to toss those heavy moisturizers and break out the latest and greatest beauty products for brightening up your look this season. This spring, there are two distinct makeup trends to look at. Try them both! This look ruled the runways for spring 2012 at shows like Proenza Schouler, Vera Wang, Carolina Herrera (and many, many more!) as well as almost all of the award shows this season. Jump on this makeup trend as you most certainly can’t go wrong with luminous skin, enhanced with a touch of gold and pink and a hint of shimmer on the cheekbones and the eyes! Apply a tinted moisturizer to your skin to get that golden glow without the harmful effects of the sun. I love Laura Mercier’s formula and it comes in a wide range of shades. Don’t be afraid of going a shade deeper than your natural skin tone. Well-groomed and shaped brows are essential. Try a brow gel to hold and shape. Apply a dusting of a golden-bronze shadow all over the lid either with a dampened or dry brush and a dash of a champagne eye shadow near the tear ducts. Use a pointed eye liner brush to apply a very thin line of Three Custom Color’s Aurora Eye Definer on the upper lash line for definition. Apply a shimmer cream on the cheek bones for a bit of glow – try Afterglow and on the lips, look for a sheer, soft pink-gold. A clean makeup look on the face anchored with bold, almost neon pops of pink or coral on the lips, and coordinating washes of color on the cheeks and eyes, is also a major makeup trend. Think of Katy Perry’s bold, stunning fuchsia lips and Claire Danes’ bright coral lips. 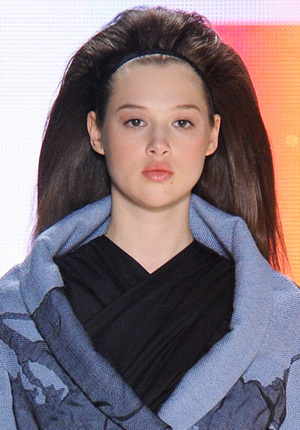 This look made an appearance on the runways at Alice + Olivia, Karen Walker and Anna Sui. Bear in mind that if the lip is bold, the eye needs to be understated. Tinted moisturizer is the way to get started here as well. Conceal where needed with your favorite concealer, as flawless skin is the key. Try Three Custom Color’s Creme Concealer. A subtle pink or peach eye shadow like Chanel Lotus should be dusted all over the lid and add a bit of a white shimmer near the tear ducts to brighten. Try Inglot #453. For a bright pink lip, try Three Custom Color’s Bora Bora and pair it with a corresponding blush such as Gaiety by NARS. You can soften this look simply by blotting the lip color and using it more like a stain.